The Lord's Prayer Poster. Prayer, Blessings, Homeschool, Religious. 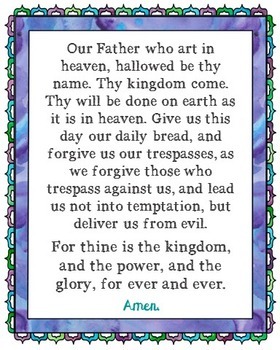 The Lord's Prayer Poster. You'll receive a JPEG that can be printed up to 24" x 30" and a PDF that can be printed on regular 8.5" x 11" paper. CHECK OUT MY OTHER STORE FOR MORE RELIGIOUS RESOURCES! prayer, blessing, bible verse, for children, for kids, mealtime prayer, dinner prayer, bedtime prayer, God, Lord, Jesus, Christian, Catholic, Baptist, Methodist, homeschool, memorization, colorful, stained glass design.